Ellen T. Crenshaw is a cartoonist and illustrator for books, editorial, advertising, comics, and children's media. Her work appears in Beer Advocate Magazine and The Nib, and her other books include Test Your Baby and Test Your Toddler's IQ (both written by Rachel Federman). She lives with her husband and two dragons. Kiss Number 8 is her first graphic novel. Colleen Ann Felicity Venable is an author, designer, and maker. 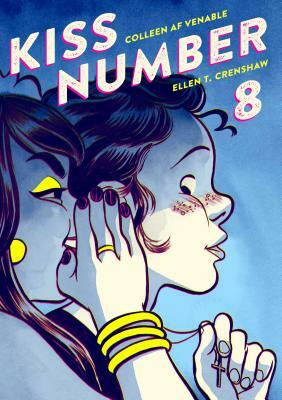 Her latest books include the YA graphic novel Kiss Number 8 (illustrated by Ellen T. Crenshaw), the quirky counting boardbook One More Wheel (illustrated by Blythe Russo). Her graphic novel series Guinea Pig, Pet Shop Private Eye (illustrated by Stephanie Yue) was nominated for an Eisner for Best Publication for Kids and awarded “Best Book” recognition from Kirkus Reviews, NYPL, Bank Street, and the Junior Library Guild. In 2017 she was named a Publisher's Weekly StarWatch Top 5 Finalist. In her day job she works as the Creative Director for Odd Dot/Macmillan, a new imprint devoted to creating playful non-fiction for kids.